Highly-trained counter terror forces had claimed to have killed four "terrorists" linked to the Islamic State group in an "intelligence-based operation" south-west of Lahore, after they opened fire at officers. Three other "terrorists", the police said, had escaped from the scene, on the outskirts of Sahiwal city, on a motorbike. But then Umair Khalil began talking to reporters in hospital - and the story he told was very different. He said his family had been travelling from Lahore to a family member's wedding in a car driven by his father's friend when they were stopped by police at a toll booth. "My father told them to take our money and not to shoot their guns. But they started firing," Umair said in the video. His parents - who ran a grocery shop - were killed, alongside his 12-year-old sister, and the family friend who was driving. Umair and two younger sisters who also survived were later found abandoned at a petrol station some distance away. A video of Umair's testimony, which tore holes in the police's version of events, began to spread among Pakistani social media users. Then footage from the shooting emerged that bolstered the young boy's story. Filmed by bystanders, it showed police firing at the car, finding the three children alive and then, before driving away with them, unloading a few more rounds into the vehicle. Pictures after the policemen left showed four dead passengers inside the car. The driver is still belted up and with a hand on the driving wheel. Another man can be seen in the front seat, and a woman and a girl are in the back. Outrage quickly began to spread. 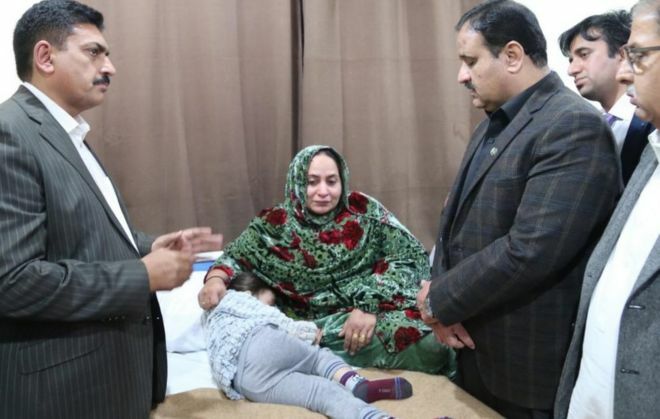 Prime Minister Imran Khan tweeted that he was shocked "at seeing the traumatized children who saw their parents shot before their eyes".